If you haven’t already heard, iiNet’s very own ultrafast, state-of-the-art Cable broadband network in Geelong, Mildura, and Ballarat now has even more value on offer. The best bit? 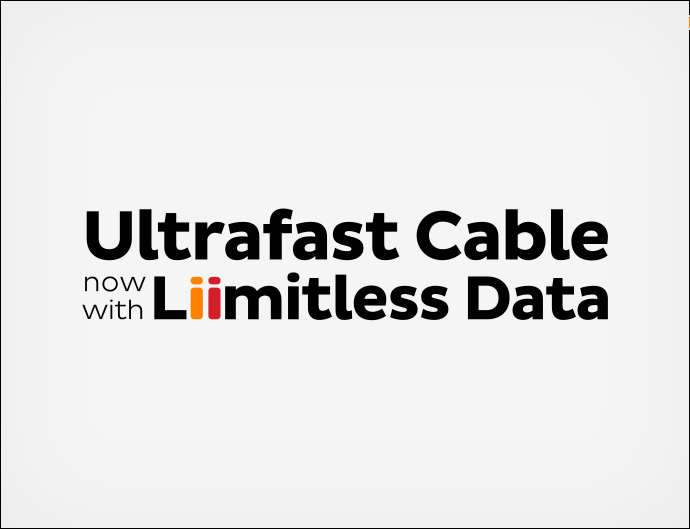 Our ultrafast Cable plan is now Liimitless! That means you’ll have all the data you could ever imagine at your fingertips. We’re all using broadband more and more every day, so we’re excited to offer a Cable plan with unlimited downloads and uploads. For those that still need a little more convincing, we’ve taken an already great-value plan and cut the cost! Make the switch to iiNet Cable and we will give you 50% off the monthly plan cost for the first 12 months on a 24 month contract^ – it’s the kind of offer that can make a big difference to your monthly budget. 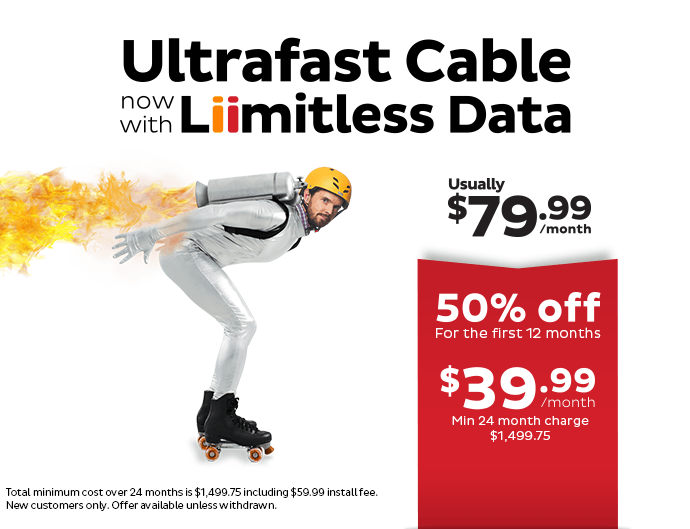 With ultrafast download speeds, unlimited data and all your local and standard national calls included, there’s no better time to grab an iiNet Cable plan and take advantage of the limitless potential. iiNet Cable is available exclusively on our network in Geelong, Mildura, and Ballarat, so if you’re lucky enough to be a resident in one of these areas, don’t miss out! Check your address on our website and give our friendly Sales Team a call on 13 19 17 and we’ll be happy to help you get connected. ^ Total minimum cost over 24 months is $1,499.75 including install fee. New customers only. Offer available unless withdrawn. Does iinet comes to Nambour 4560 Qld. I am currently with Westnet but phone with Telstra. If I want to bundle phone and internet. How I do it, is there anybody come to my house to help plus how much fee or free. Westnet is part of the iiNet group, and as such you should be able to bundle a phone service with your existing Internet service. You can do this through the My Westnet page (https://www.westnet.com.au/customers/) or by contacting our accounts team on 1300 786 068 who will be able to talk through your options and apply any changes. I am a client of Westnet/iiNet and have been for getting on for 11 years year. I have also not long connected to westnet/iiNet cable service and can recommend it to anyone that wants a reliable service and sound support. Its service is excellent and sometimes I am asked why I do not use another that might be cheaper?????? To me service is more important to me than whether someone is cheaper. Cheaper frequently means cutting service. However, I do have a question. I may have to move to Melbourne next year in the East Ringwood area. I would prefer to continue with Westnet/iiNet, do you have a comparable service in that area? I am a researcher and the Net is a valuable tool as long as it is fast and reliable. First up, thanks for your feedback for the cable service there! At this stage East Ringwood wouldn’t be part of the Cable network footprint and doesn’t appear to have a clear ETA on NBN rollout. Given this, the existing PSTN and ADSL network would be the most likely service type to be available with speeds of up to 24 megabits per second achievable depending on your line’s distance from the exchange and quality. We’d definitely suggest giving our team a call on 13 22 58 any time it’s close to moving so we can take a closer look at any address and what to expect! Hi, When will this come to Padbury Western Australia? Our internet is slow and frequently drops out. After all WA was the original home of iinet. Don’t fret if there is currently no construction underway! Register your interest and we’ll keep you in the loop with service availability. Would this limit drastically internet browsing experience speed ? Connection speed attainable would not vary based on overall AUS coverage, Virgi. As long as your area has been classed as serviceable, an application can be submitted to connect to the NBN service (FTTN, HFC etc) available to your area. Should you experience any difficulties with connection performance, we’ll be able to address these via troubleshooting and fault lodgement as required. As long as have the required infrastructure in place for your area, we will be able to give you an NBN connection. Wondercom (TPG Parent company ) Rolled fibre cable down Richmond area in Melbourne . letter in mail saying I could connect to Wondercom as fibre has been installed to the Basement of my Building . Was with Foxtel Broadband with download speed of 10mbps, crap service . Joined Wondercom and next day Technician came out switched internet on in the Basement and apartment still using the existing phone copper line . My Download speed is 93mbps and upload is 38mbps . If my area is hfc, do I need to find a hfc (cable) plan to connect to? We’d love to have you onboard for our HFC services. The good tihng about these plans is that you don’t need to move to the NBN when it rolls out as well. Thanks for leaving your comment! Would you mind getting in touch via iiOnline@iinet.net.au? We can’t guarantee anything here but we can pass this on to the relevant parties for their feedback.